Charles Supper Company Micropositioners are the smallest and most varied group of standard products available today for performing precise manual adjustments. They can be designed into new instruments and assemblies or be readily adapted into existing ones. Charles Supper Company Micropositioners will facilitate fine positioning for many applications in the medical, optical, electro-optical, laser, photographic and related fields when micro-size, stability and fine adjustment are of prime importance. They are very suitable for design into new fixtures and assemblies, and are easily adaptable to existing assemblies. Durable aluminum construction with hardened stainless steel drive screws and permanent lubrication. 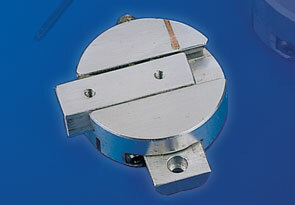 Supplied with a 1/16” spline drive key for adjusting and locking each motion into position. Drilled and tapped holes are provided for versatile mounting arrangements. X-Y Micro-Slides Featuring four sizes ranging from .844” O.D. 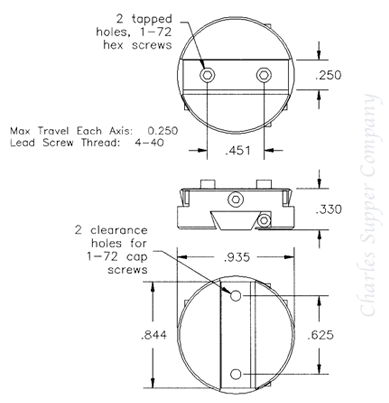 with 0.250” X-Y travel to 1.487” O.D. with 0.3125 X-Y travel, each translation sledge may be fully locked. For mounting, one sledge has two drilled and tapped holes and the second has two holes countersunk on the inner side.